Today is one of those days when it’s great to get out of the house, but then, it’s even better to be indoors! It’s in the 18-19 degree range, with blowing snow and ice. My youngest son is on day one of an Arctic Survival Camping trip about 200 miles north of us. Up there, they are expecting in the 10″ – 20″ range of snow. 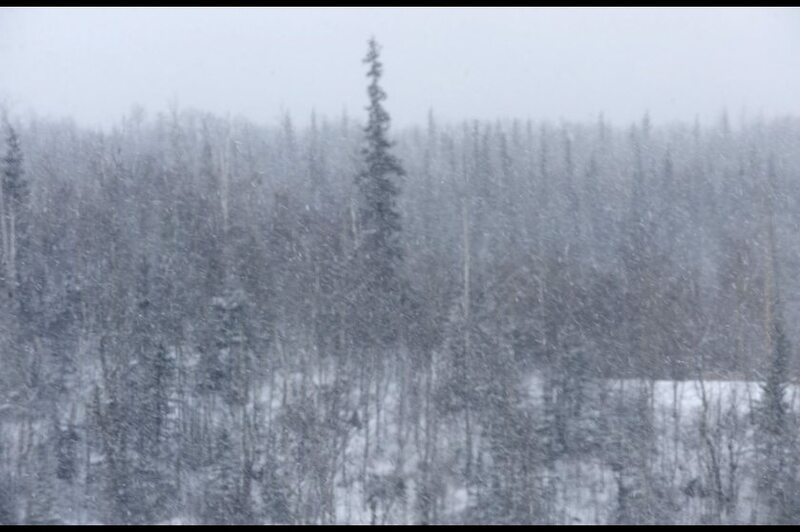 At our neck of the woods, we expect in the 1″ – 2″ range! So I was thinking about him as our glass door banged against the front door as the wind battered it. I sure would not want to be in a tent in this! Of course, I am nowhere near 15 years old and filled with excitement of living off the land, male bonding, and all that sort of thing. If I camp, I need a camper or trailer; better yet, a hotel room…no more tents for this grandma! Anyway, I have been mulling over a bunch of thoughts in my head and they all sort of relate. Which is weird, but cool at the same time, because I know God has a lesson in there for me. A friend was given a baby boy to foster this week. He is so adorable, I just wanted to cuddle him and kiss and hug him. He has the cutest smile, ever. And he reminded me of my grand daughter, as they are just a couple of weeks apart in age. He was removed from his birth home because of abuse. As I l gazed on him in the Church Hall during coffee hour on Sunday, I had tears running down my face, and I grabbed the sides of his car seat and gave that little man my best smiles and coos, because I was weeping for so many reasons. (1) His age is so close to my grand daughter and I have to admit, I have a serious love affair with that little baby girl going on. Grandma fell hard for her. (2) I hurt because of his situation and then (3) I got so angry at his situation that it made me cry more. I just hugged my friend and told her how happy I was he found a home where he will be cuddled and loved on 24/7! And (5) I was taken back, in my mind, to a horrible time in my life, a few years ago. So many things were going on. But to sum it up, we were going through a short-sale on our house, my husband was out of work, our youngest son was having difficulty in school (as in a totally, and completely, untenable situation), my work situation was not good (governmental layoffs), and I got selected to be on a felony child abuse jury. It was a long case. It was an ugly case. I tried, and tried, during jury selection to get myself out of it, but for some reason, both sides wanted me on that jury. (One main reason is that I was a government employee at that time, and as such, I get paid full salary regardless of where I show up to work. Jury duty for government employees is considered another day at the office. Ugh.) I was instantly taken back to those horrible photos and testimonies. I was instantly feeling my stomach just clench in anger and frustration. Another aspect that made it so horrible for me is that the child who was “feloniously” abused looked exactly, as in “could be related to,” my youngest son. I would go home at night, unable to talk about it, and just weep. My husband would hold me and I would just cry my eyes out, only to fall into a fitful sleep, and be required to get up and repeat it for another day (for weeks on end). I thought I had put it behind me. But meeting that precious little boy yesterday brought the memories swooping in, and I found myself unable to stop thinking about it. And I am obviously still thinking about it. “Keep me safe, LORD, from the hands of the wicked; protect me from the violent..” Psalm 140:4. This morning my daughter-in-law asked me to go to breakfast, and since I am home alone this week, I jumped at the chance. Off we went to iHop. I had some amazing crepes, buckets of coffee (daylight savings time is just so stupid…) and sat across from her sitting with my two grandies, and me, just watching it all and loving every moment. She and I talked about my memories, and about my friend who took in this little baby. We both got teary-eyed at the thought of someone hurting such a little guy. And as I gazed at my grandies, I got such a fierce sense of protectiveness. I don’t know what I would do if anyone hurt any of them, in any way. God calls us to protect those who cannot protect themselves. And He also calls us to love our enemies. As I sat on that jury, looking at a father who had abused his child so severely, I tried to love him; I really did. And I prayed to God to help me handle that situation. What draws a parent to harm their child? I know kids and crying are no fun, but I just could not ever abuse a child. I’d put myself in a time-out before I could hurt a child. And as I tried to love this abuser, I knew “beyond a shadow of a doubt” he was guilty and voted to convict. I could not help him any more but by putting him where he could no longer harm anyone else. After this trial, things disintegrated in my life to such a degree I found myself taking anti-depressants and took a leave of absence from my job. I drove my middle son to college and drove home (across 4 states over about 18 hours) listening to a Mercy Me CD a friend had given me (thank you, Raghada) and just prayed. I prayed about my life, about the situation of my son and his schooling, my job, our living situation (by this time we had to vacate our home and move to a rental, but my husband had a new job – a bright spot). I spent those hours with the windows all down, singing at the top of my lungs (trust me, it was good I was alone and in the vast desert for that part of it) and I realized that my life was disordered. That was it – I was in disarray in so many areas. And a calm clarity came to me, as I stared at my Jerusalem cross hanging from the rear-view window. God needed me at home. My son needed me at home. My husband wanted me at home. My brief foray into the working world had come to a close. I needed to focus on a childlike approach to God, as well as to not hinder my children and keep them from God. For my youngest son, the same one who is off on an Arctic Survival adventure this week, I needed to bring him home and help him myself. 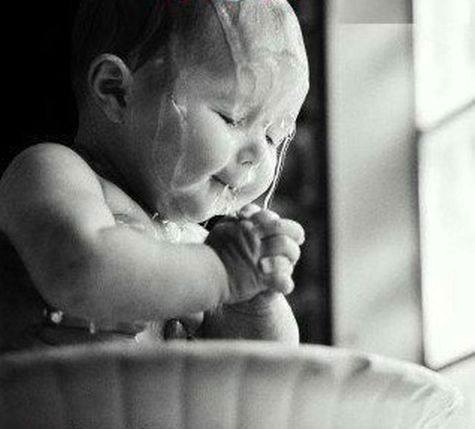 My first duty is to be a faithful child of God; my second is to be a wife and mother. Both my husband, and my sons, needed me at home. My husband liked my paycheck, but he hated me working. Our lives run so much smoother with me at home. And so I went back into homeschooling (we are now doing HS!!!) and keeping the home fires burning. And as a stay-at-home wife and mother, I have a real sensitivity to protecting these helpless little ones. 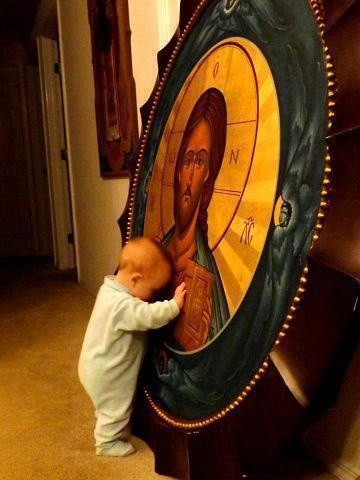 They can be infants, they can be 10, they can be teenagers, but we need to bring our children to a safe haven and to “hinder them not” in their discovery of their faith. I still struggle with seeing little children abused and my anger about their situation and the adults who perpetrate these crimes against children is something I wrestle with (as became so obvious to me yesterday). But I do know that we are all here to bring our children to God. We are here to be sure they are safe. We are here to give them a firm place, a foundation, to grow into healthy, Christian adults. We are perhaps not here to tame this world, but to work out some of the kinks and make it not such a horribly rough place to be, and to raise the next generation, who can work at softening the edges of the evil one, who definitely holds sway over so many. 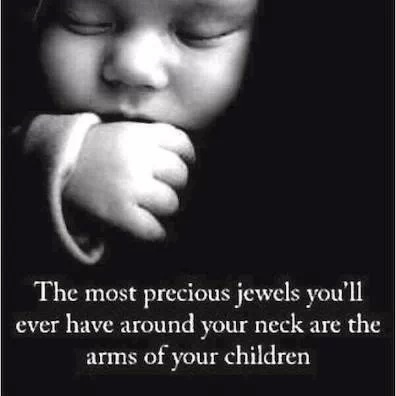 I know I feel protective of these little ones I see in the arm of friends who put themselves out there for them, and I love that there are families willing to share with the hurting children in our world. But I also know I am here to keep an eye on my own family, my own children and grandchildren, making sure they are safe and free to grow up and love the God I know is here, protecting me. I am preparing for the birthdays of two of my sons tomorrow. One will be 24 and is married with a baby daughter; the other is turning 15. I am fresh out of babies!! It seems only yesterday that my 15-year-old was born. It was a surprise because we had no idea we were having a baby! We had gone Christmas tree shopping the weekend before. As my two older boys (13 and 9 at the time) were decorating the tree, the younger one (the story is still in dispute between these two!! Ha-Ha) stepped on a broken glass ornament behind the tree. As the older one lifted him over a small dividing wall, blood was dripping down. We realized right then that it was going to be a doctor’s visit and stitches pretty quickly. So our day and evening was a chaotic one! Our younger son came home on crutches and would be missing out on the local soccer tournament the following day. His dad was coaching his team and both my husband and older son were signed to referee the tournament. We got home around dinner time and dealt with a 9-year-old who had stitches in his foot and a 13-year-old denying any complicity! Later that evening, we had a phone call from the cousin of a good friend. She recalled a conversation we had at a family bar-be-que FIVE years prior, and she asked us if we still wanted a baby to adopt. I never hesitated. I immediately said, “Yes.” And then I said, “Hang on; let me be sure my husband is okay with this! !” He was very okay with it and the next morning, our son was born. I took my 9-year-old on crutches with me to WalMart (my older son and husband went on to the soccer tournament). 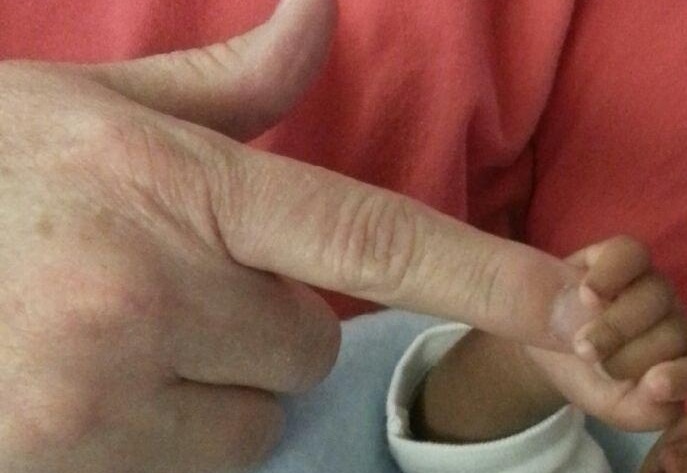 I grabbed a baby blanket and a car seat and headed to the hospital. When the nurses greeted us, they were awesome. They had me back up my car to the entrance and loaded us up with all sorts of baby things – bottles, diapers, blankets, t-shirts, socks. It was so unexpected but wonderful. We loaded him up and off we went, to introduce him to his father and older brother at a soccer tournament! What a tournament that turned out to be! He was the hit of the day! Newly born, wrapped in blankets against a chilly December day, and sleeping sweetly in his car seat. 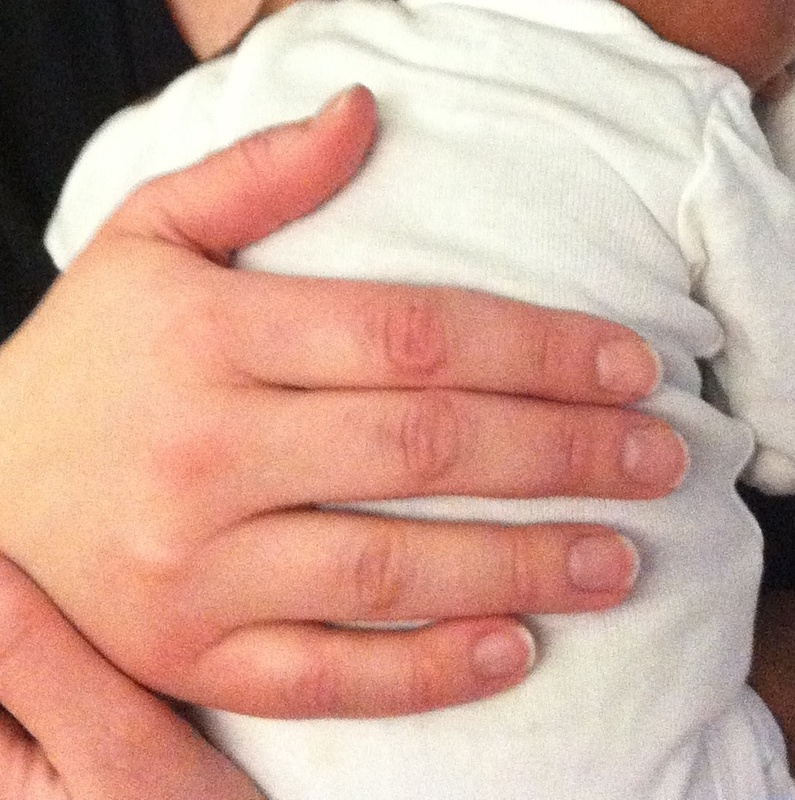 From the moment I first held my son at just a couple of hours old, I loved him. It is amazing to me how much God allows us to love. We are the ones with the hang-ups; God wants us to love all people. And I could not love this young man any more, had he been brought forth from my own loins. He is my son. Period. It is interesting to me that people feel free to comment and criticize adoptive parents, families, and the process, especially if there are differences in race in the adoption process. It is like complete strangers stroking the belly of pregnant mothers. People seem to think it’s okay to comment on the make-up of our diverse family. My response to people initially was, “Where were you; where was your community, when no one wanted this child?” My husband and I never hesitated in welcoming this child into our home, hearts, and family. My other sons love him like they love each other; there is no difference. There are differences due to age, but the two older ones have that, too! He has blessed us more than he will ever realize. I know God needed me to love this young man and to have him hold a part of my heart forever. 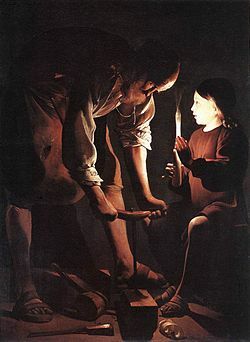 At this time of year, I am drawn to the story of St. Joseph. An angel appears to Mary and she accepts that God’s will be done and that she will bear the Son of God. Now, imagine: Mary is already betrothed to Joseph and she finds out she is pregnant, but not by Joseph, as she is still a virgin. First of all, I don’t think we in the West truly have a grasp on what betrothal means. In the East, the betrothal is declared after the couple have met with their priest, their parents (if it is appropriate) have agreed with the impending marriage, and the couple agrees to the wedding (usually about a year away). The couple has a formal ceremony, wherein they make their vows and exchange rings. They continue to meet regularly with their priest and plan their wedding with their families. At the end of the betrothal period, the couple finalizes their agreement and is married by the priest. In the East, the priest marries the couple. It is not like the West where the priest is just a witness. The sacrament is conferred by the priest. And the wedding closes a year or more of preparation. 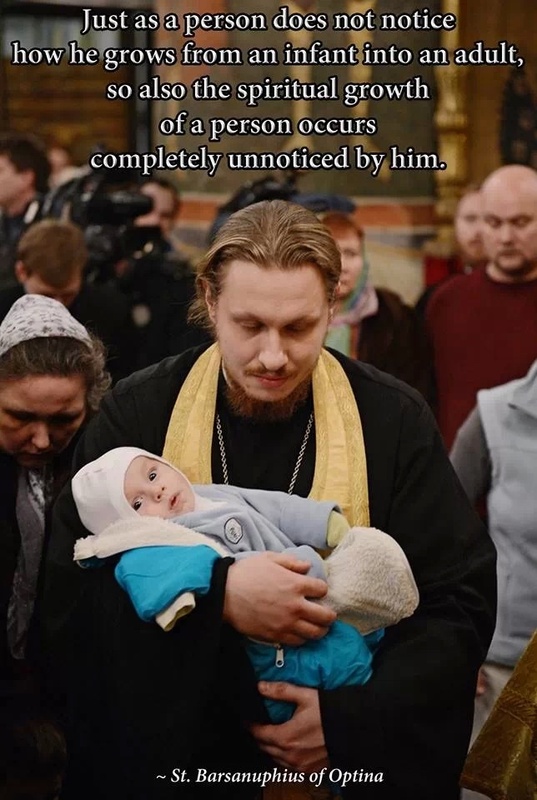 It is a process and the church community, the priest, and the families are all a part of it. So let’s place St. Joseph in this. He hears rumors; Mary has up and left to visit her cousin. He has no idea what’s happening. The little community is abuzz with gossip. The Romans are talking “census” and the political climate is stressful, to say the least. Mary makes her way back to town from visiting Elizabeth, where she felt her Child communicate with His cousin, John the Baptist. Their relationship would grow over their lifetimes into something amazing. As Mary is traveling back to Joseph, an angel appears to Joseph and tells him everything is okay; Mary is to bear the Son of God, and he needs to take her as his wife. Mary comes home, Joseph accepts her and they marry. I can only imagine all the gossiping about that! (People gossiped badly back then; just as badly as they do today. And what is sort of sad is that it probably wouldn’t cause too much chatter in our current moral climate!) 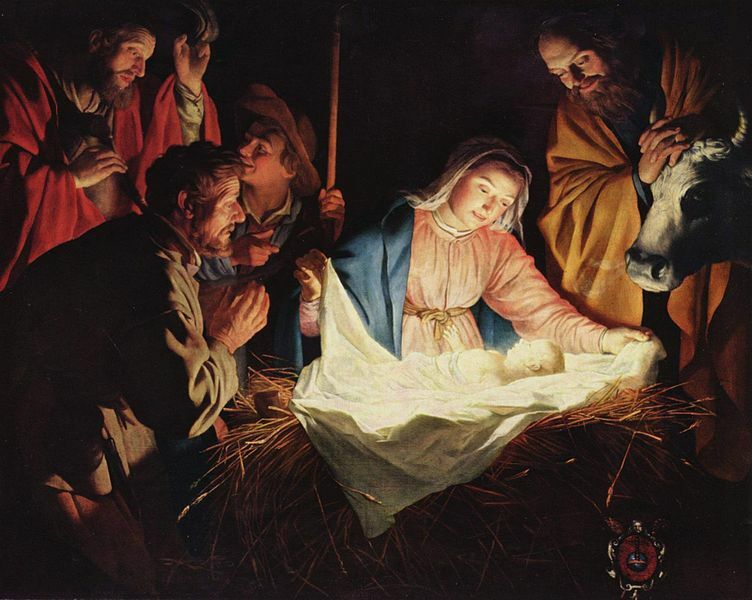 Right when they are wed, the Romans tell everyone about the census requirements and Joseph has to take his very pregnant wife with him, so he can be counted at the town of his birth (can you imagine the world having to be part of a census like that now? Where would you have to show up??). And Joseph never hesitates. He does what is right in regards to the law – the law of the land and the Laws of God. He takes Mary, fully confident she is bearing the Son of God, and off they go on the back of a donkey. Joseph took Mary on faith, fully believing Her Son would save us all. He loved Christ as his son, knowing all along that He was the Son of God. Joseph should be the patron of adoption! He accepted Mary on faith, loved her with all his heart, and took Jesus as his son. He interceded for Jesus when His life was in danger, rescuing both Mary and Christ when an angel again appeared to him and warned him in a dream to get away. What was coming was the slaughter of the Holy Innocents. It is the feast we celebrate on December 29th, which is our wedding anniversary. It is another feast day that points me to adoption, and it is an ancient story about the sanctity of human life, as Herod had all male children from birth through two years of age killed, just in case one of them grew up to challenge his throne! I love this painting. 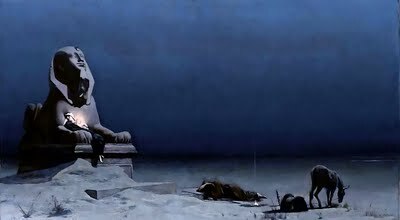 The sole source of Light is the Christ Child, asleep in His Mother’s arms, atop the Sphinx. St. Joseph is pictured asleep, next to their tethered beast, with a small fire next to him. Quiet, peaceful, and safe. Joseph raised Jesus as a carpenter, teaching him his trade. He was already an old man when Christ was born, but he raised Him as best he could, giving of himself for his family. I love that my husband and I could open our home to another son. I thank God for this gift of life that has blessed us so immensely. 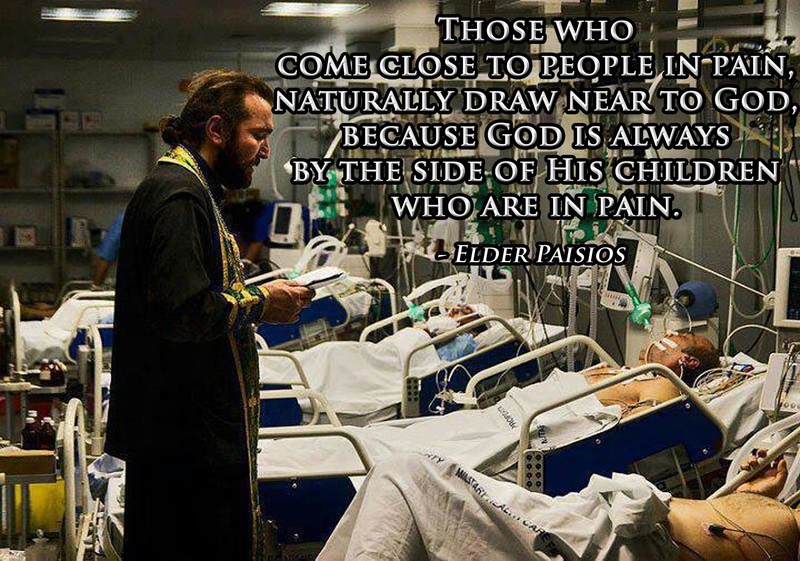 God knows how easy it is for us to love; to love each and every one of our fellow men. 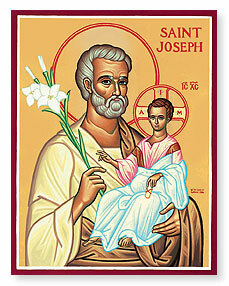 He gave a wonderful example in St. Joseph and his love for Christ and the Theotokos, Mother of God. And each year I am reminded of the blessing of life in our home. The years are passing so much more quickly than they ever have. I mourn the days of little feet running all over the house and fingerprints on windows and tripping over toys. 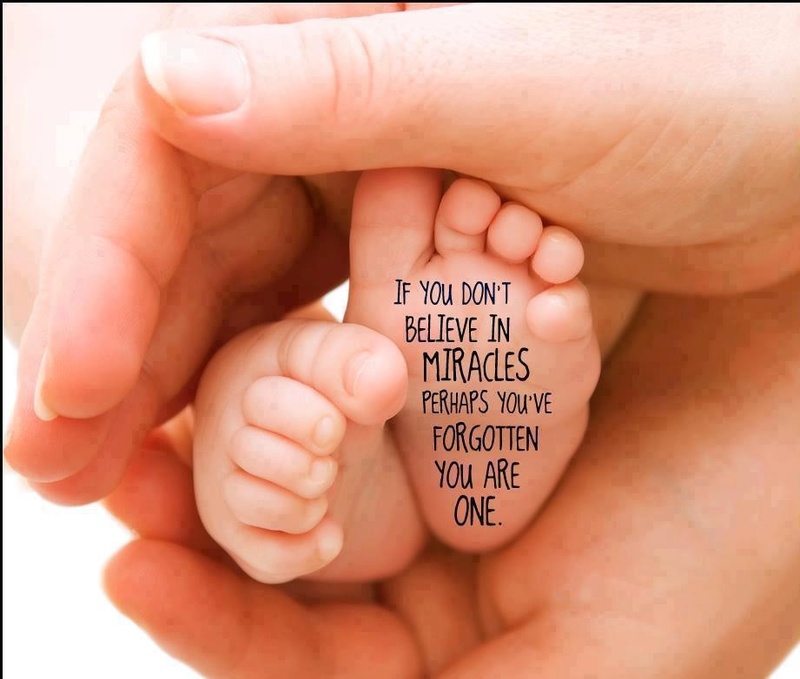 But God has gifted me with grandchildren and so the cycle of life continues!! I give thanks for my sons, their wives, and my grandchildren. And this last son still at home lifts my heart with his humor and his silliness. His not-so-tidy bedroom is something I will miss in many ways, when it is his time to journey on in life. And tomorrow it’s birthday cake, friends, and pizza! And I am sure lots of laughing and joking and high school teenagers being just that. Time is racing past and I am trying to enjoy these fleeting moments. 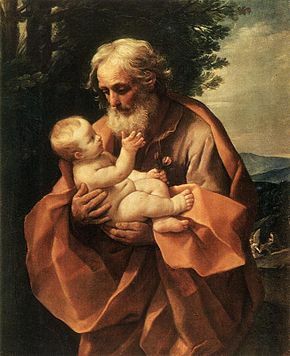 St. Joseph reminds me to be faithful, unquestioning, and to just love.